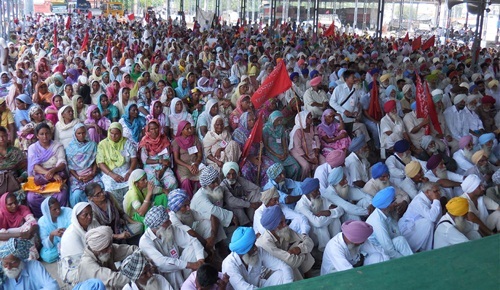 A joint massive convention was organized by Four Left Parties today at Grain Market grounds at Barnala by four Left parties – CPI, CPI(M), CPM Punjab & CPI(ML) Liberation against the anti people policies of the centre and state governments and for settlement of the genuine and just demands of the working people. More than 2000 people from Malwa region of Punjab participated in the convention. Comrades Charan Singh Virdi, Hardev Arshi, Mangat Ram Pasla , Sukhdarshan Natt, vijay Misra and Jagroop Singh while addressing the convention held the neo liberal policies pursued by the central and state governments responsible for increasing price rise, unemployment, rampant corruption, indebtedness of the peasants and agricultural workers. They condemned the Akli-BJP government led by Parkash Singh Badal for the Drug menace, deteriorating law and order situation, increasing atrocities on dalits and women. They further said that the drug trade is being run with the connivance of the politicians and the police. They alleged that the sand, cable and transport mafia is run under the patronage of the ruling dispensation with support from the police.